Surprise! It’s me!!! Miss me? Because I’ve missed you dearly. It’s been too long since I’ve been here and I am appalled at how delinquent I’ve been, and surprised at how much I have really missed the blogosphere. I think I rather like surprises. It’s the element of the unexpected; the feeling of wonder and astonishment. It represents endless possibilties for you to chance upon, but truly embracing it requires lots of bravery and a sense of adventure. We are all familiar with the pleasant surprises in everyday life – a surprise party, unexpected flowers from a significant other, or a welcome phone call from a long-lost friend. But what about the surprises that aren’t so agreeable? The ones that throw your plans off course and make you spin around at a loss? I woke up Friday morning to such a surprise – a shroud of furious white storm spinning outside my window, threatening my flight to Vegas for the weekend. Still in bed, I checked my iPhone dejectedly as flight after flight showed cancelled statuses. As I got ready for work, Surprise! A text from my coworker: “Office closed for the day due to storm. Yay!” With work out of the way, I decided to head straight to Newark Airport to ensure my spot on a non-cancelled flight. On the NJ Transit Train, I optimistically looked out the window as the snow started to lighten up into gentle wispy flakes. Then Surprise! A text from Brian: “Honey, check your flight status. I think your flight has been cancelled.” WHAT?! But what was a girl to do? I continued on my way and hoped to sweet talk my way into another flight. So you see, I do like surprises. They keep you on your toes, sprinkle some adventure into the everyday mundane, and in the end, things usually turn out all right. Take these Paella Cakes for example. This recipe started out as Risotto Balls, but as I started cooking the arborio rice, my mind drifted back to thoughts of Spain and the unforgettable stations of paella cooked in the largest pans I’d ever seen, and all of a sudden, I found myself chopping up veggies, adding in tomato paste and red wine, and finally saffron water (a bit out of usual order). 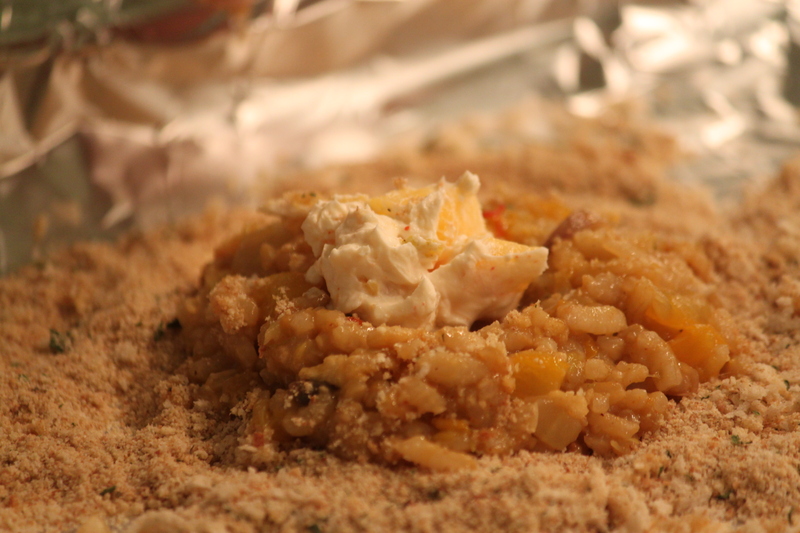 But I had already made the “surprise” filling that was meant to go into the milder flavored risotto balls – a tangy, creamy mango-cream cheese stuffing that I wasn’t so sure would go well with the bold flavors of the paella. So I made some with and some without. At the end of the day, it was clear that the ones with the surprise filling were the winners. Although at that point, it was impossible to tell which one was avec or sans, so we had no option but to pick them at random, and Be Surprised! If you want to shake things up, make some with and some without filling and decide for yourself which is tastier! Now pour a glass of Rioja and enjoy! 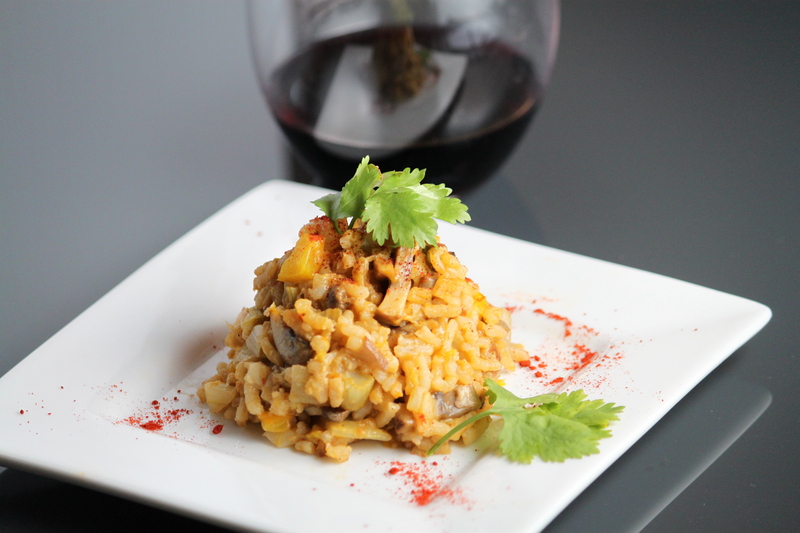 And if you have any leftover paella (like I did) you just pour more Rioja and enjoy the Paella in its purest delightful form! 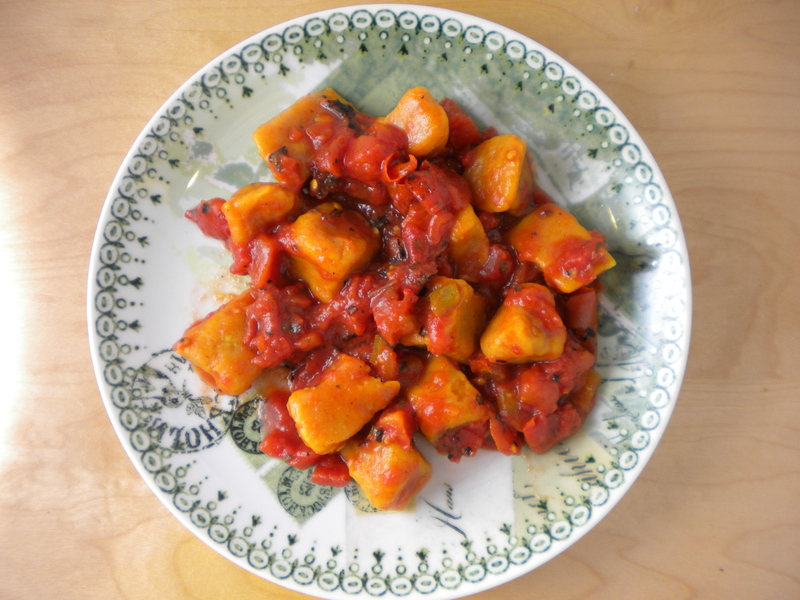 If you type into the Google Machine “Pumpkin Gnocchi“, you’ll find lots of wonderful recipes by recipe sites and food bloggers with slight variations on how to make the gnocchi. You’ll also see that it is usually complemented with a lemony, buttery Brown Butter Sage Sauce. So I thought I’d change things up by bringing 2 new challengers into the game, and see if they can claim the title of sauce king over the reigning Butter Sage. Making the Gnocchi: Combine the flour and pumpkin together, add the spices and seasoning, fold in the egg, and finally the parmesan cheese to give it a pop of flavor. On a floured surface, roll dough into long, 1/2 inch ropes, cut into 1 inch pieces. In a pot, bring lots of water to a boil, add in some cooking oil to prevent sticking, and slowly drop the gnocchi and cook in batches until they float on top (it’s very quick – maybe 3-5 minutes). 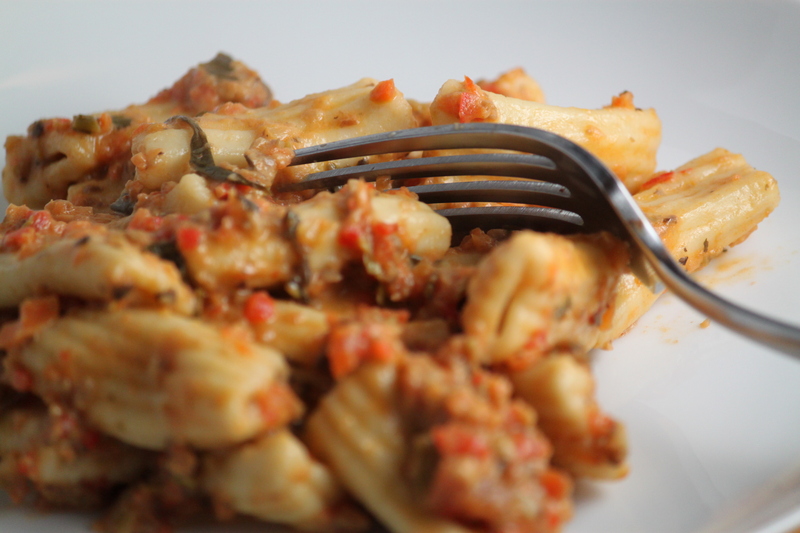 And there you go, easy, delicious, foolproof gnocchi! So without further ado, let the games begin! This sauce is a complete classic. The lemony flavor of the sage and savory butter melts together with the Pumpkin Gnocchi to create an irresistible combination. It’s the quickest sauce to make and does not fail to please. Round 1: In a saucepan, melt 1 stick of Salted Butter in low heat, chop up 4-6 Sage Leaves and cook in the butter until the aroma of sage fills your nose. 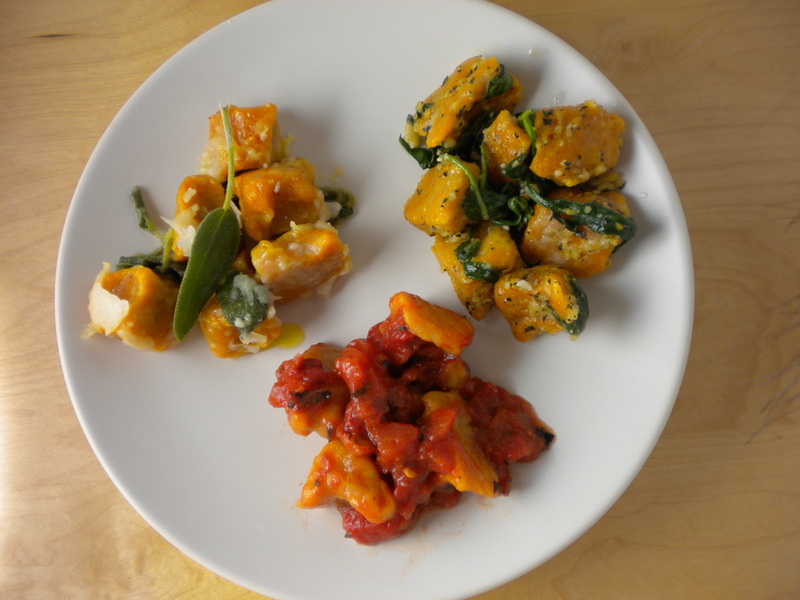 Add 1-2 Tbsp of the Starchy Water used to cook Gnocchi to thicken the sauce, and pour over the Pumpkin Gnocchi. Garnish with Parmesan Flakes and additional Sage Leaves on top. This Spinach Pesto Sauce is nutty, flavorful, and so well-balanced that it puts anyone who comes into contact with it in danger of overeating! 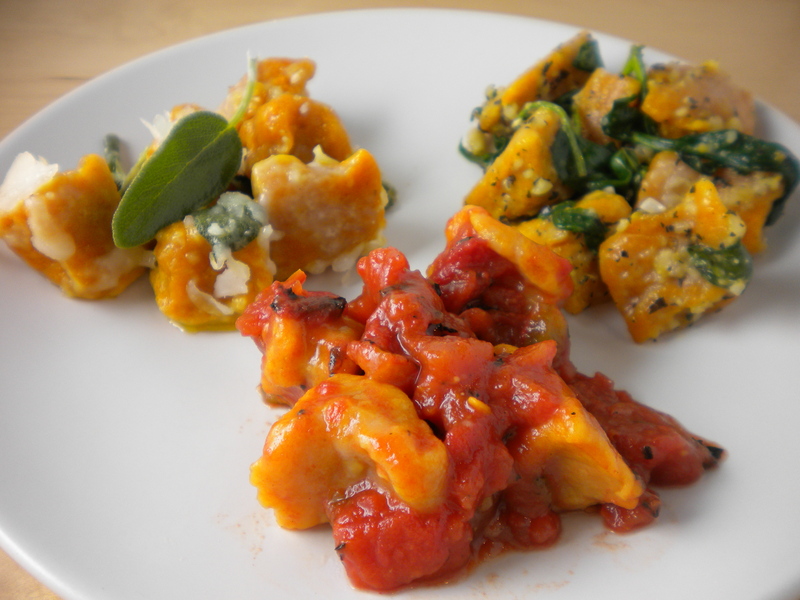 He boasts of healthy ingredients that bring out the sweetness of the Pumpkin Gnocchi. He takes slightly longer to prepare but is well worth the short wait! Round 2: In a mini food processor, pulse together 1/4 cup Olive Oil, 1-2 scoops of Pine Nuts, 1 handful of Chopped Basil, and a sprinkling of Salt & Pepper until it reaches a fine consistency, but not slushy. In a saucepan, heat some cooking oil, and saute the Spinach until cooked. 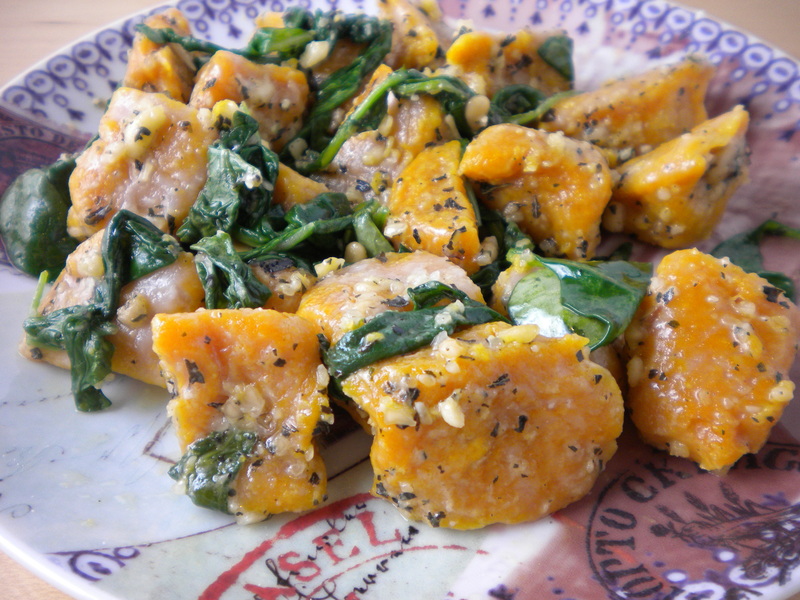 Add in the pesto mixture, cook for another 1-2 minutes, and pour over the Pumpkin Gnocchi. This Challenger is a bit of a free spirit and wild card. Never one to conform to tradition, he encompasses different cultural flavors and brings his big hearty taste and spicy smoky flavor to the competition. Round 3: In a saucepan over medium heat, pour in 1 can of Diced Tomatoes (I used Trader Joes Diced Tomatoes with Green Chiles). Add in 1-2 finely chopped Jalapenos, a generous pouring of Red Wine, and a few shakes of Ancho Chili Powder, Chipotle Chili Powder, and Cayenne Chili Powder. 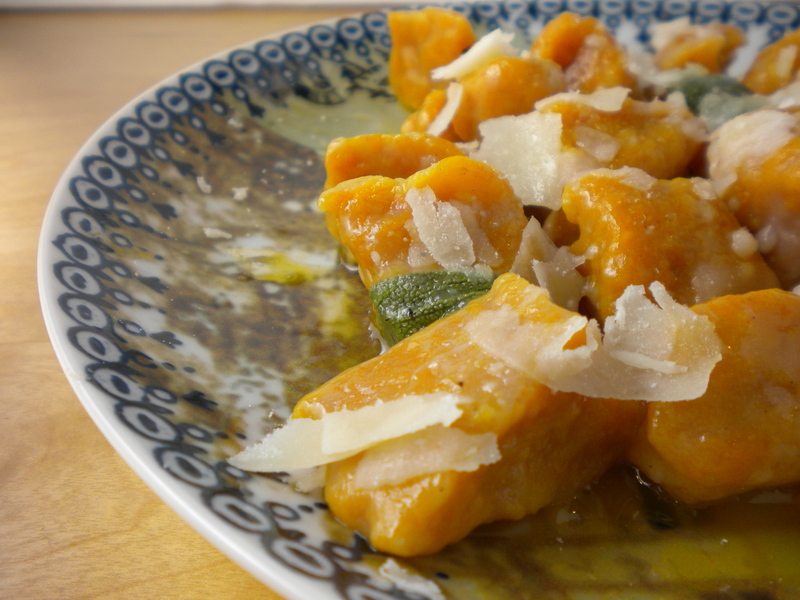 Simmer for 5-10 minutes and pour over Pumpkin Gnocchi. So did the Brown Butter Sage Sauce reign as the incumbent, or did one of the challengers take the crown? Brian and I sniffed, tasted, and devoure. And after careful deliberation, Brian ruled that the Butter Sage Sauce was still the best, affirming why it remains the most popular accompaniment. I on the other hand, could not stop eating the Spinach Pesto Sauce and deemed that one the winner. We both agreed that while the Smoky Marinara Sauce was delicious, its strong flavors overpowered instead of complemented the Pumpkin Gnocchi. So the final verdict is that: While the Brown Butter Sage Sauce remains a strong contender, there’s a new sauce in town that threatens its throne! Which will it be? You decide! Every year approximately 2 months before Christmas, I start getting giddy with excitement. So powerful is this Holiday for me that I am unshaken by the spooky merrry-making of Halloween, and I glaze past Thanksgiving with a grateful heart, but all the while looking ahead to Christmas Festivities. 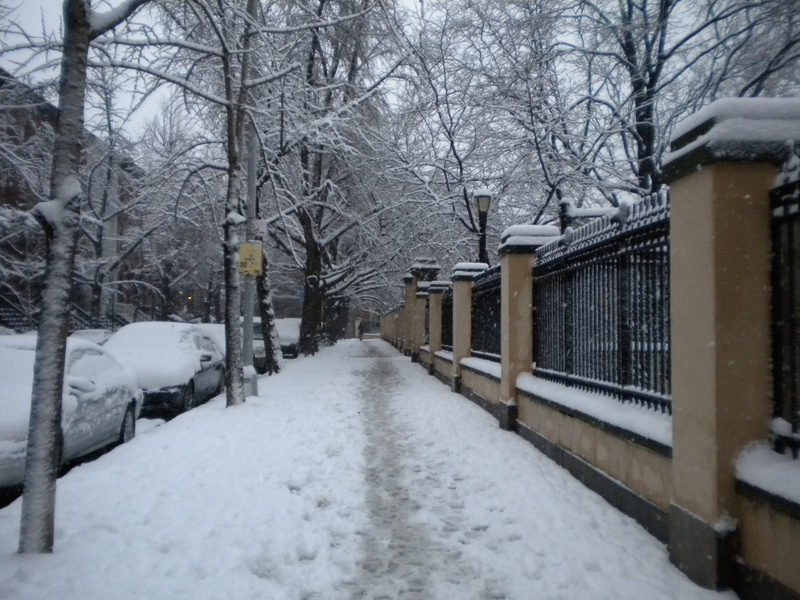 It took me until now – a mere 2 weeks before my favorite holiday of the year – to dawn with the realization that It’s Beginning to look a lot like Christmas. 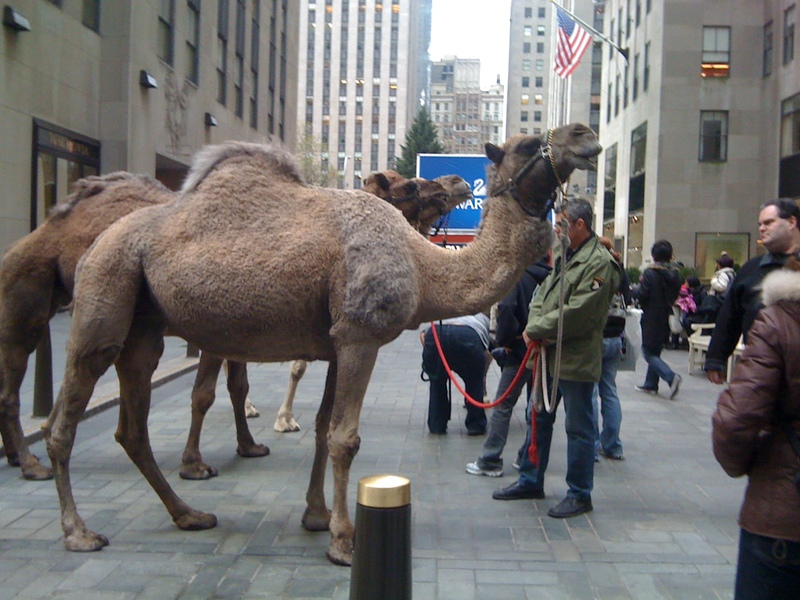 Camels in Rockefeller Center? I'm still trying to figure this one out...something about the 3 wise men? Someone please enlighten me! 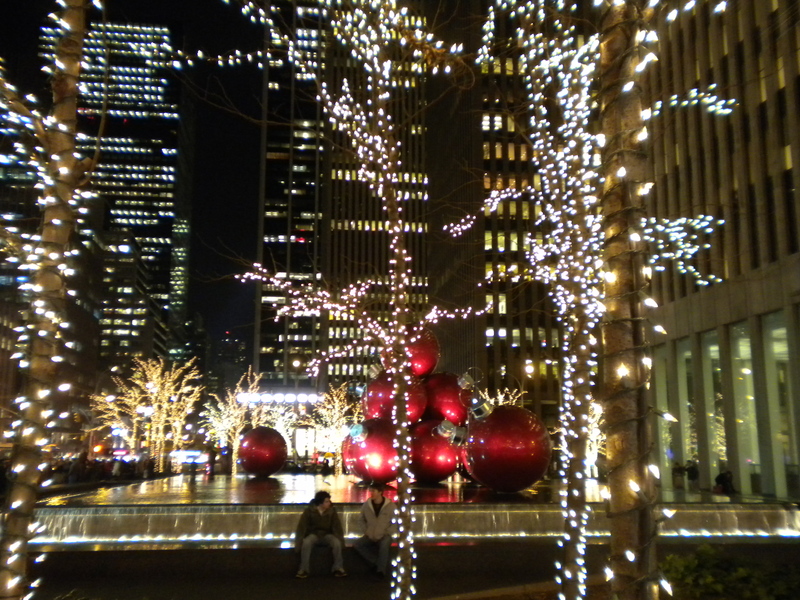 Even my office building is participating in the Christmas Spirit by bringing out these gorgeous bright red ornaments! 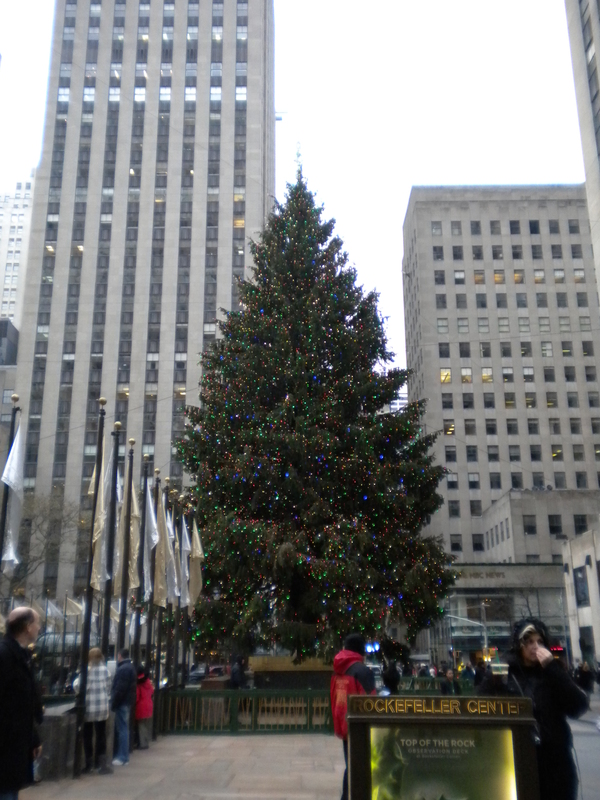 Christmas everywhere you go. This picture was sent to me by Brian, on business in the UK. 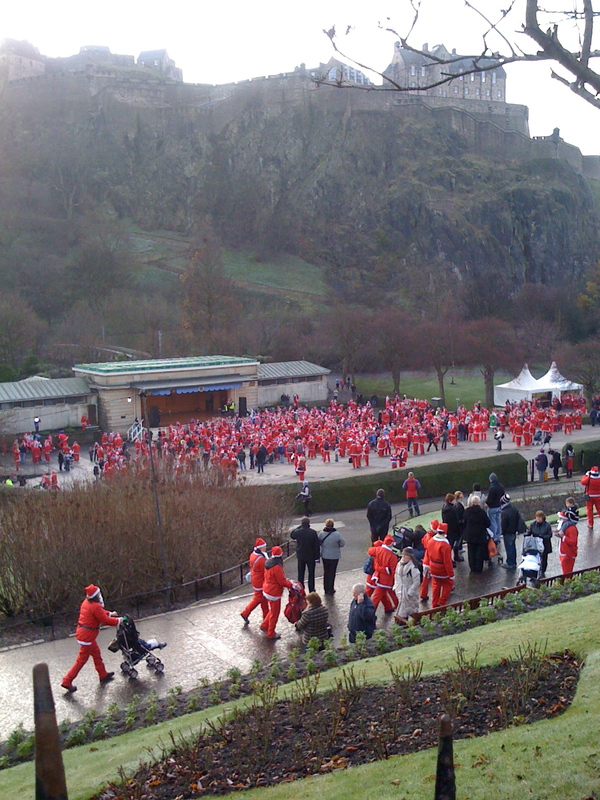 100s of Santas gathering underneath the Edinburgh Castle! So now that the Christmas Spirit has fully consumed me, I feel compelled to create dishes evoking memories of Christmas past. Chestnuts have always been one of my favorite winter munchies. The sweet succulent delights conjure images of the family enjoying these roasted delicacies while gathering ’round to watch movies in our pajamas. We found so many ways to enjoy them – drizzled with honey, sprinkled with salt, dipped in soy sauce. But in all these years of savoring them, I’ve never actually created a dish with them. So last night, I decided to work it into a simple weeknight pasta dish – letting the sweet smoky flavor of the chestnuts mingle with the savory taste of the mushrooms, and tying it all up with the peppery zest of the arugula and buttery nuttiness of parmesan cheese! Prepare the Chestnuts: Cut the shell with an “X” where the shell bulges outward. Place the chestnuts in a dish and completely cover with water and soak for 20 minutes. Place in a baking dish and roast at 400 for 20 to 25 minutes. Remove from oven, peel, and chop! Bring water to a boil, season with salt, and boil the egg pasta for 6-8 min, until cooked.Drain and toss with a little olive oil to prevent sticking. Pour in the egg mixture and scramble everything up. Add the chopped chestnuts and cook for another few minutes. 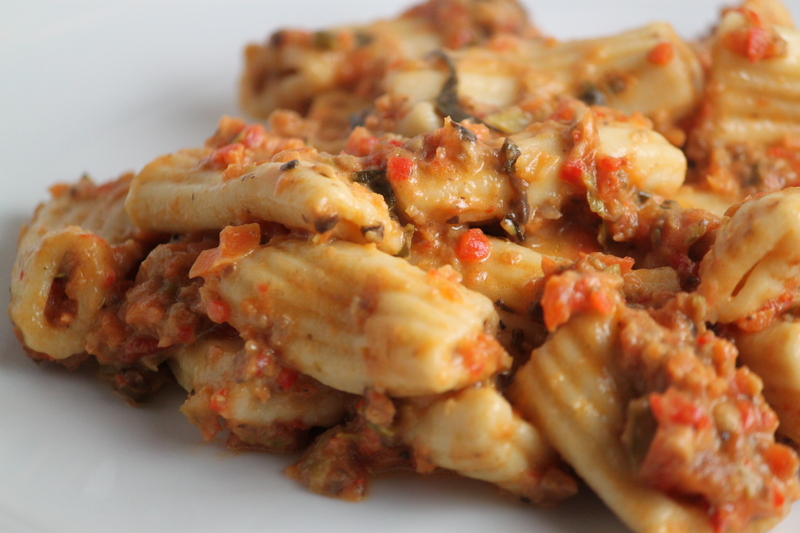 Stir in the pasta and the remaining olive oil and mix until everything is well coated. Add in half of the parmesan cheese, and sprinkle in tarragon and more salt & pepper to season. Turn the heat on low, add in the arugula and toss some more, making sure the arugula does not actually cook and stays crisp. Scoop onto a plate, decorate with more parmesan flakes, and fill your tummy with Christmas! If you can’t eat mushrooms, try other meaty veggies like eggplant. Other proteins like tofu or soy protein veggie “meat” products would blend well too. Once upon a time, there was a little Eggplant who lived in the produce section of the Japanese Market. Eggplant’s dream was to be part of a Sushi Roll. 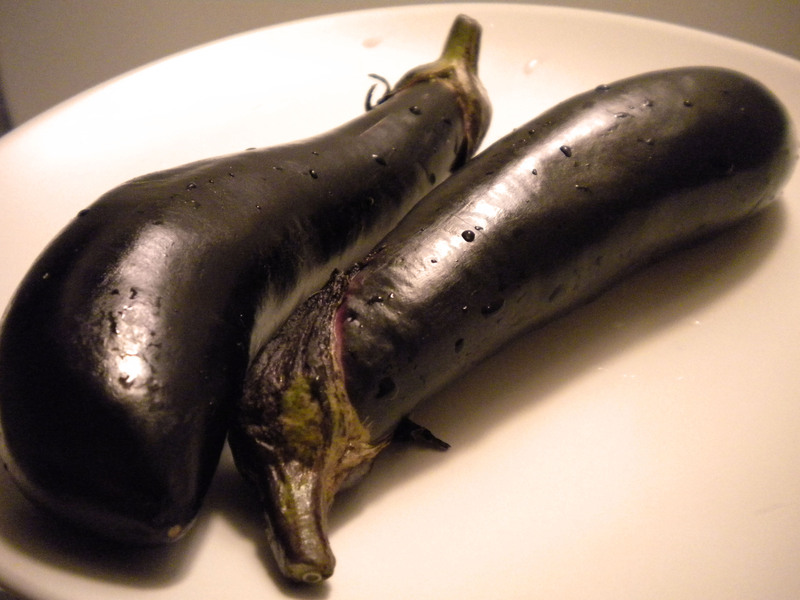 Alas, whenever Sushi Making took place, Eggplant was never selected as a candidate. He looked on forlornly as his friends Avocado and Cucumber were repeated picked, and puffed resentfully when he was passed over for the smelly fishy Tuna. The Experimental Chef was skeptical. “But sushi ingredients are usually fresh and raw. You would have to be cooked. And how would I flavor you to complement the rice and nori?” Eggplant replied, “But aren’t you an EXPERIMENTAL Chef? Isn’t it your business to figure these things out?” At a loss for a good comeback, the Chef shrugged, put the Eggplant into her basket, and headed home to figure out how to tackle this challenge. After some pondering, the Experimental Chef went to work, mixing up sauce potions, cooking the Eggplant and it’s friend the Beech Mushroom, and rolling the sushi. As she took a bite into the roll, a smile spread across her face. 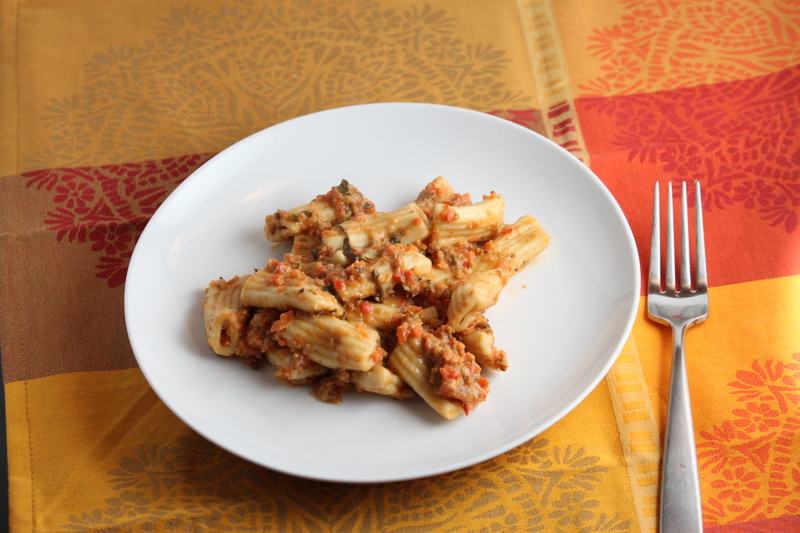 She thanked the Eggplant for reaching out to her, and vowed to share this wonderful recipe with the world. That night, the Eggplant sat in Shelly’s Belly, content that he had fulfilled his lifelong wish. He hoped that his brothers and sisters would also make an appearance in a sushi roll sometime soon. Make the Sushi Rice. Proportion – 2 cups Long Grain Rice + 2 cups water + 1/3 cup Rice Vinegar + 1 Tsp Mirin + 1 Tbsp Agave Nectar. You can make this in a rice cooker or on a stove top. 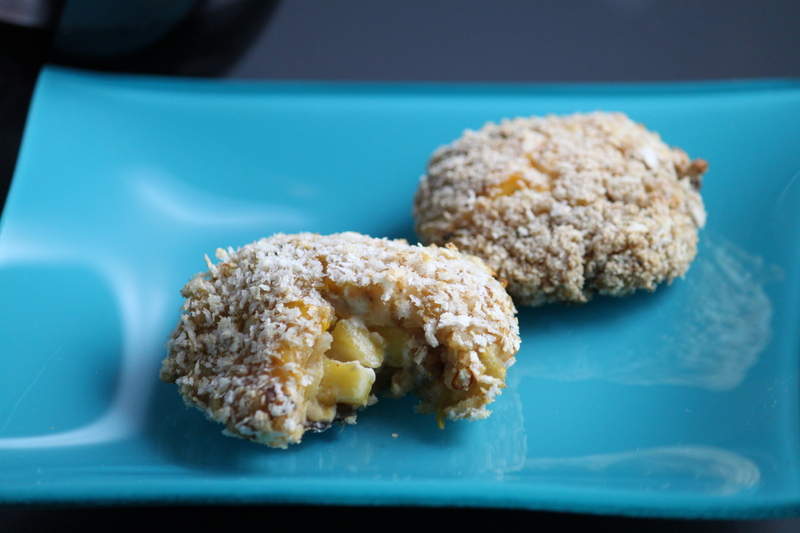 I prefer to stick it in the rice cooker – fluffy perfection every time! Set a Nori Sheet on a flat surface. Take about 1/2 cup of the cooked rice and spread on half of the sushi. Place the eggplant and mushroom on top. 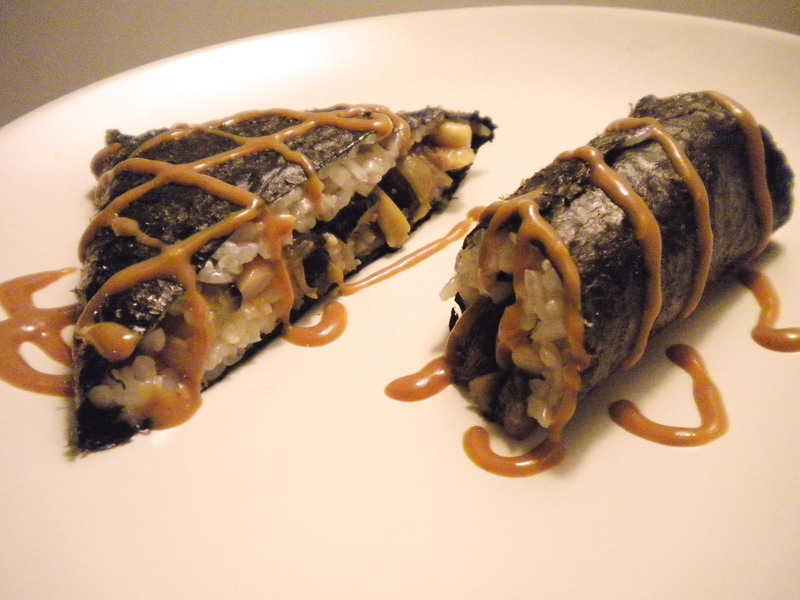 Sprinkle with Sesame Seeds and roll the sushi, using small amount of smashed rice to glue it together at the end. Drizzle with Peanut Sauce or Mayo (optional). Cut into desirable pieces, and enjoy with pleasure! I really think this could have used some greens – something like spinach or watercress would have been great! Other cool veggies I’d like to try: Bamboo shoots, shitake mushrooms, celery, zucchini, roasted bell peppers, yams. Instead of rice, I think it’d be interesting to use mashed potatoes or hummus. 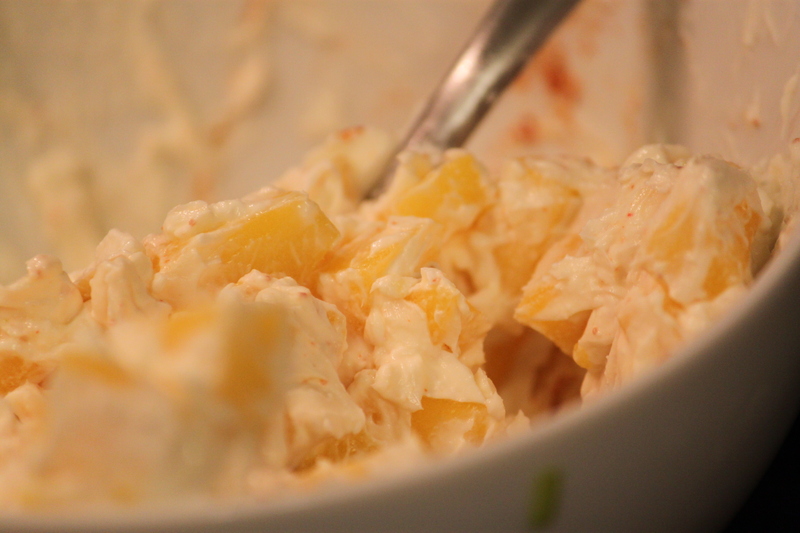 Try some other sauces – what about a citrusy vinaigrette, or maybe a mildly curry flavored mix? 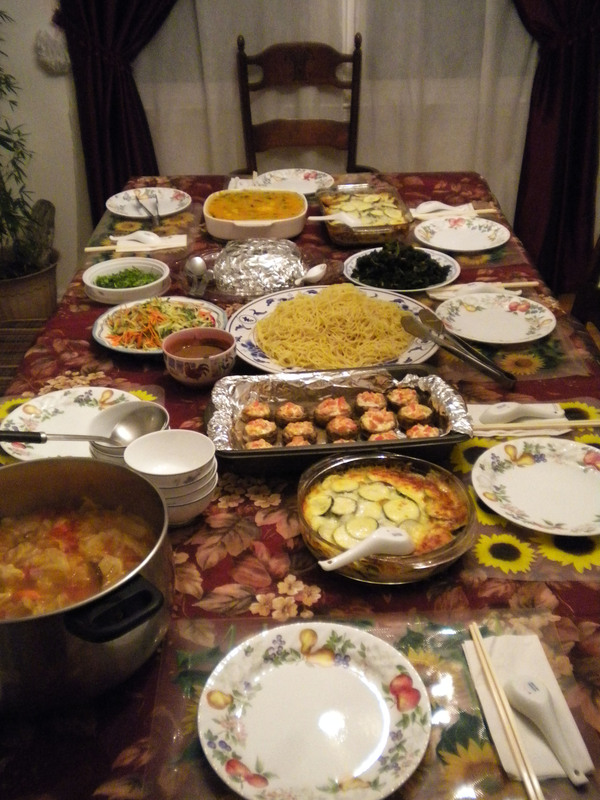 Thanksgiving – the gathering of loved ones, the expressing of gratitude, the stuffing of food! Did you, like me, abandon your calorie count and gorge yourselves at your spectacular Thanksgiving Feast? Are you as tired of leftovers as I am? Does your stomach groan when it hears the words “Gravy”, “Gratin”, and “Casserole”? If so, I thought I’d spare you all the recipes of the fluffy sweet potato souffle and the cheesy eggplant zucchini gratin and post a dish that is still related to this holiday, but may not have been on your Thanksgiving table. Chinese Sticky Rice (also known as Nuo Mi Fan) has been a tradition in my family since well as long as I can remember. Instead of the traditional bread cubes or cornbread, we make our stuffing with good old rice! What’s not to love? It’s a dish that’s aromatically fragrant, infused with ingredients that trigger your “umami” tastebuds, and a refreshingly healthy choice next to all the bubbling cheese and sugary pies. I’ll admit, it’s a time consuming recipe, but worth every minute. AND it’s not just for Thanksgiving, which means you can enjoy it…right now (or more accurately in 3 hours)! Soak the sticky rice in cold water for 2 hours (make sure water completely covers the rice by at least 1 inch in excess). In a frying pan or wok, heat up some canola oil and throw in the sliced mushrooms and Morningstar crumbles adding in just a tad bit of soy sauce and salt & pepper. Stir fry until you can smell the aroma of the black mushrooms. Drain the sticky rice and add to the pan/wok. Now, add the veggie broth, making sure rice is mostly covered. Turn the heat to medium low, cover with a lid, and let simmer for 30 minutes. 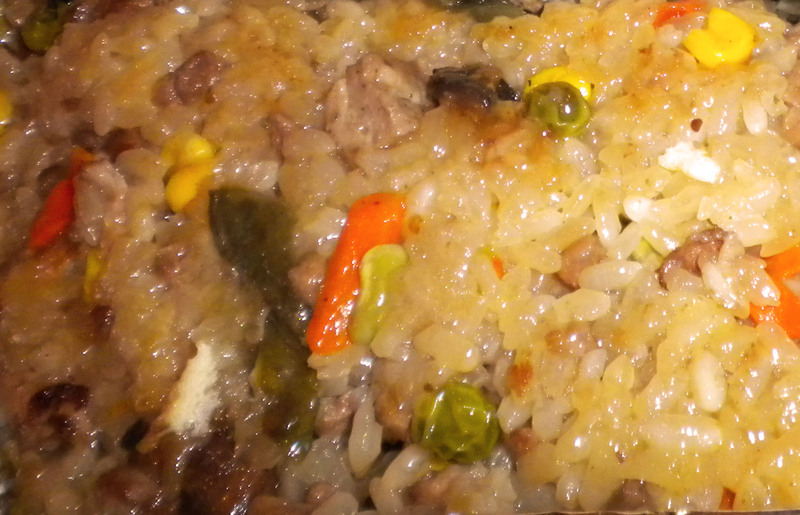 When the rice is done, all liquid should be absorbed and it should have a soft, sticky consistency. Next, mix everything up again, add in any last minute flavoring, garnish with the rest of cilantro, and…Bon Appetit! Like fried rice, you can add in any of your favorite ingredients. I’d advise that the black mushroom remain a staple because it adds so much flavor but here are some other suggestions: Water chestnuts, bamboo shoots, snow peas, cabbage, spinach, hard tofu cubes, leeks. Feel free to add in other spices and flavors that strike your fancy, like curry, five spice, oyster sauce, or sweet chili sauce. Wrap them in some spring roll wrappers and you’ll have yourself a Chinese burrito! If you’re in the mood for something sweet instead, simply swap the soy sauce and savory ingredients for agave infused water and raisins, dates, and red bean paste. And if you’ve made it this far down, I’d like to express my deepest Thanksgiving thanks to all of you! The support I’ve gotten and the friendships I’ve made through this blog has added so much flavor and excitement to my life. 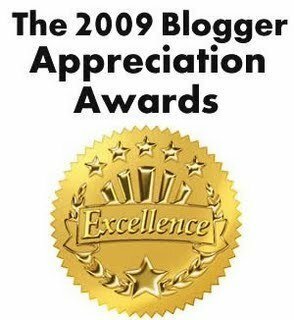 So I’m passing on this 09 blog appreciation award to all of you before 2009 ends! Thanks to Kristy for passing this along to me. Kristy’s enthusiasm in the kitchen and her effervescent personality is just infectious. She has been such an inspiration and her blog is full of delights and surprises, so give it a visit if you haven’t yet! 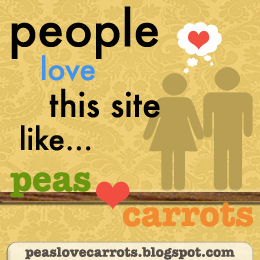 I also received this awesome Peas Love Carrots award from Mathea. Mae is a truly original artist and total trendsetter, even though she emphasizes that she is not “hip”. Her ideas are astonishing, her writing is whimsical, and her creations are imaginatively exceptional. I’m hoping she won’t get mad at me for not 100% following the rules and posting 7 odd facts about me. I’ve already done that and I’m afraid posting 7 more will really make all of you wonder if I’m quite right in the head. However, I will pass on the blog love to people I haven’t had a chance to pass on an award yet. Kristy @ My Little Space – I think the above says it all! Divina @ Sense and Serendipity Stumble upon some serendipitous posts on nutritious dishes – you’ll be happy you did! Joy @ joylicious Make some discoveries in the joy of food! 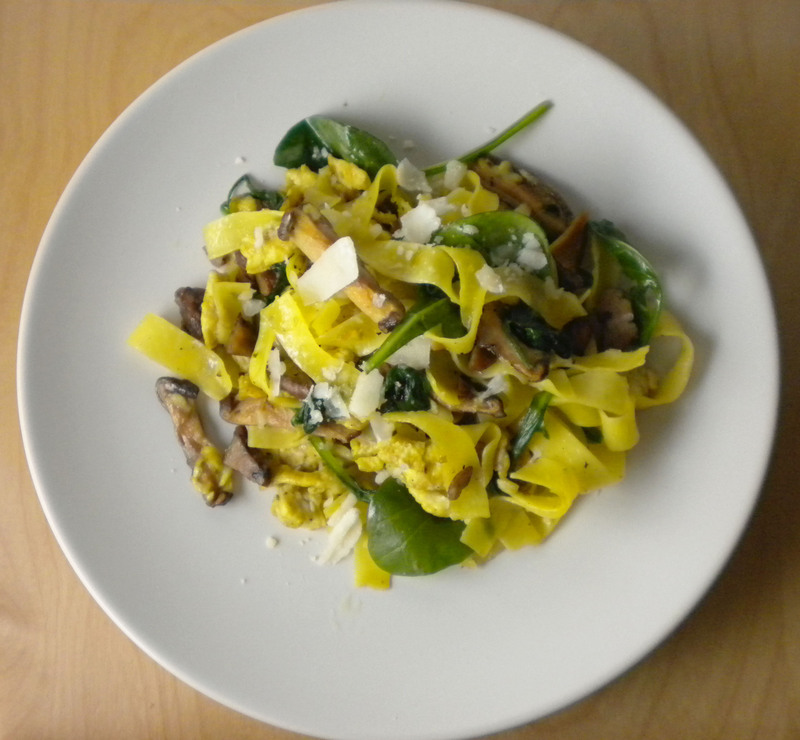 Inspired by a delicious, couldn’t-stop-eating-it pasta salad from a catered lunch event, I decided to create a creamy pasta dish based on 2 hero ingredients – Leeks and Mushrooms. Leeks have long been one of my favorite ingredients to work with. Sweeter and more subtle than its onion cousin, leeks add depth and complexity to any dish with its delicate, buttery flavor and silky texture. 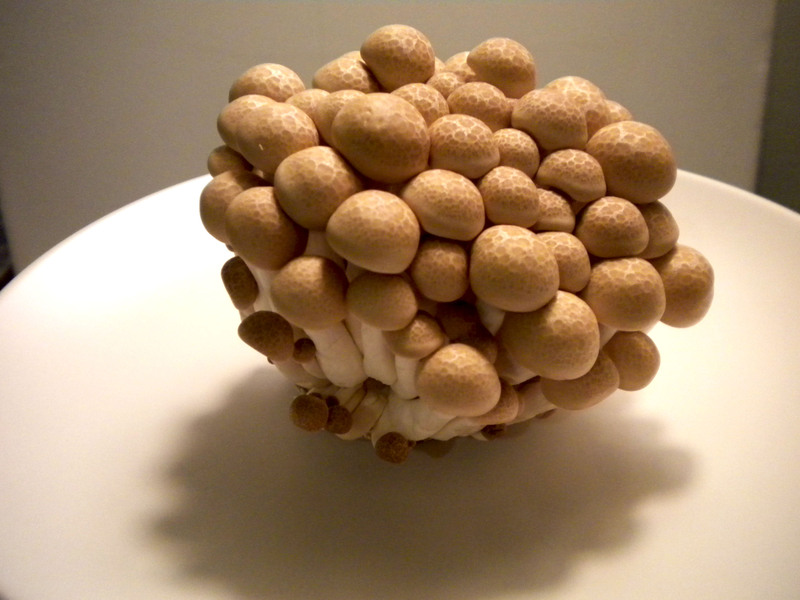 And there’s nothing more mouth-watering than the hearty flavor of earthy mushrooms to whet your appetite. For my adaptation, I decided to braise the leeks and mushrooms in broth and red wine, and complete the dish with a creamy tarragon sauce for a French twist. Tarragon, next to Basil and Cilantro, is one of my favorite herbs. Its aromatic sweet smell permeates the kitchen while you cook, and its hearty, almost meaty flavor adds dimension and mystery. 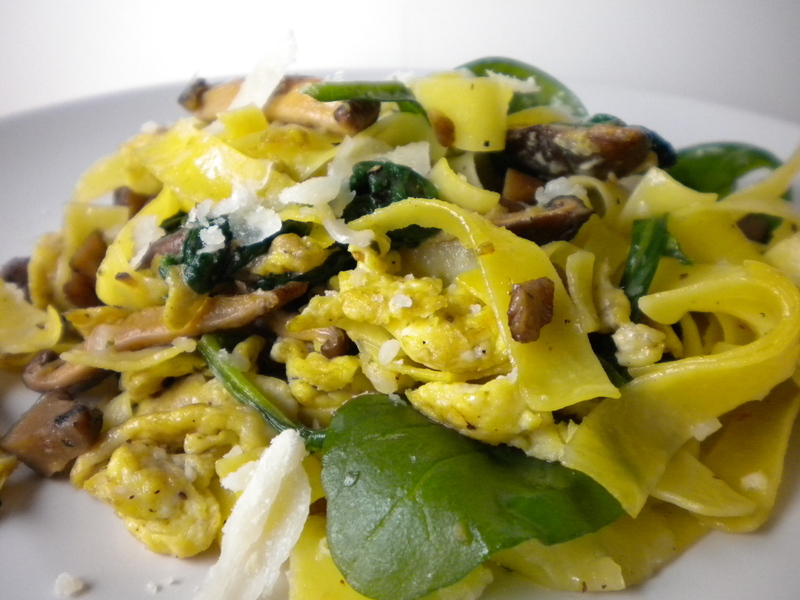 Finally, I chose Farfalle for its beautiful butterfly shape and suitability with cream sauces. 1. Prepare the pasta – flavor water with salt, boil for 10-15 min until al dente, drain, sprinkle with a little oil, toss, and set aside. 2. Saute the leeks with butter, fleur de sol (or just salt), black pepper, and a little broth until leeks are tender and the aroma fills the kitchen, taking care not to overcook the leeks (brown leeks are not yummy). Remove from heat and set aside. 3 Saute the mushrooms with butter, salt & pepper. When mushrooms start to brown and soften, add broth, wine, a pinch of tarragon. Cover, and braise for about 6-8 minutes (simmer on low heat) until mushrooms are thoroughly flavored. 4. Add the leeks and Farfalle. Add some cream, more broth and red wine and another pinch of tarragon. Turn to low heat and let sauce thicken. Toss in 1/5 cup of parmesan cheese and 2 oz of grated swiss cheese. Mix well and serve hot! 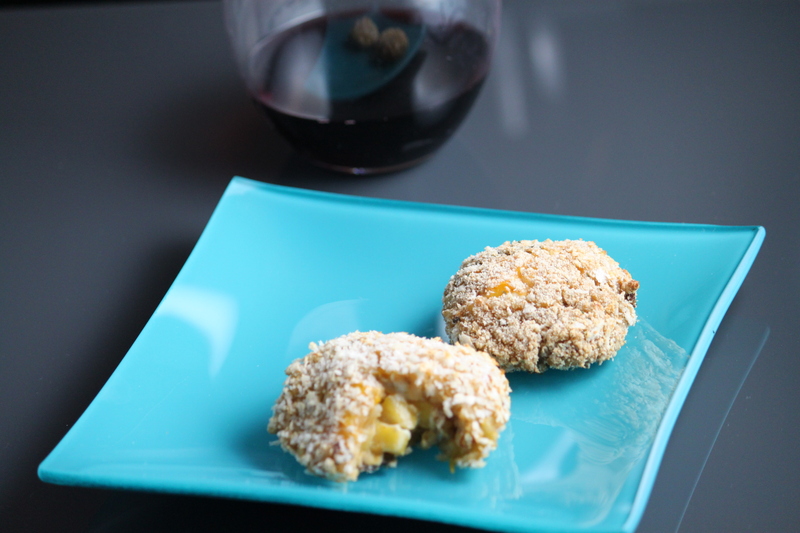 Substitute red wine with port or sherry to add a sweeter flavor. Try dry white wine for a milder taste. Replace Swiss Cheese with any of the following: Gruyere, Fontina, Mozzarella, Edam, Gouda, Pecorino, Romano. Or skip it altogether. It’ll be just as good! If you’re a Buddhist Veggie (like my parents – meaning you don’t eat Onion/Garlic/Leeks) you can use Asparagus instead.